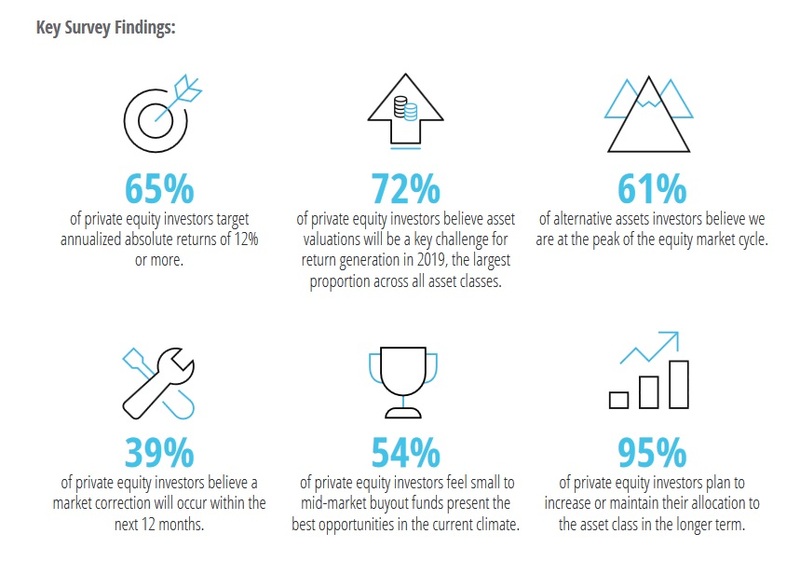 The Preqin Investor Outlook: Alternative Assets H1 2019 finds that 61% of institutions now think that equity markets are at a peak at the start of 2019. This proportion has been rising over the past 18 months, and the sentiment has raised concerns that equity markets are due for a correction in the near future. For some institutions, this is impacting their approach to their alternative assets portfolios: key reasons investors give for investing in the industry include portfolio diversification, inflation hedging, high risk-adjusted returns and non-correlation to other asset classes. The roles that alternative assets perform for investors are becoming more pivotal in the face of a potential downturn. 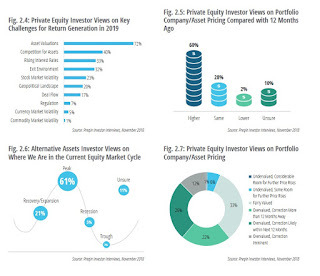 Increasingly, investors are beginning to act accordingly – a quarter are looking to commit more to private capital as a result of their market outlook, while 40% of hedge fund investors are positioning their portfolios more defensively in response. More than four out of five investors (82%) now commit to at least one alternative asset class. 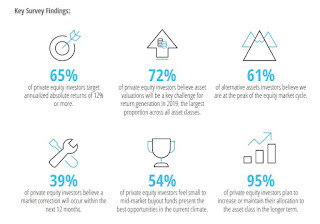 The majority of investors allocate to private equity, real estate and hedge funds – 70%, 64% and 51%respectively. A third of investors each allocate to infrastructure, private debt and natural resources. The most commonly cited reason for investing in each alternative asset class is diversification. 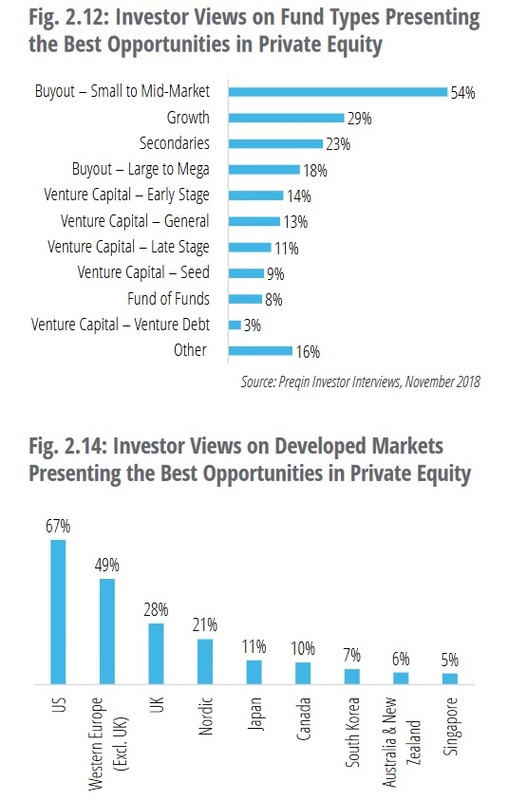 This ranges from 56% of private equity investors to 73% of real estate and infrastructure investors. Sixty-one percent of investors across all asset classes believe equity markets are at a peak, up from 56%that said so in June 2018. Just 21% believe we are in an expansion phase, down from 27% six months prior. 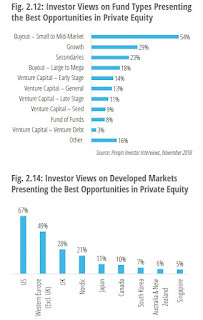 In response to their outlook, 26% of private capital investors are putting more capital into the industry, while 10% are drawing back from private capital investments. Similarly, 79% of hedge fund investors plan to maintain or increase their allocations in 2019 – the highest proportion recorded by Preqin since 2014. In the longer term, the net majority of investors across all asset classes intend to increase their allocations to alternative assets. 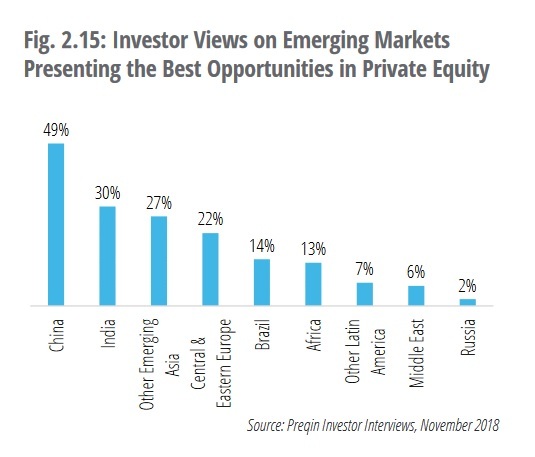 Take the time to go over the Preqin Investor Outlook: Alternative Investors H1 2019. 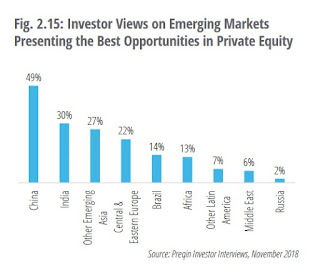 Since the majority of investors allocate to private equity, I will focus on investors' outlook for this asset class. The report states the prospects for private equity remain positive but pricing is at a record level and this is the biggest concern for investors over the next 12 months. Go back to read last week's comments on Peloton's differentiated approach and the Canadian Business Growth Fund. A long-term approach in the mid-market space definitely makes a lot of sense in the current market. Large equity cheques allow private equity sponsors to compete better against cash-rich corporate buyers, to avoid concentration risks in a particular firm or sector, and to pursue bigger deals thanks to the record high dry powder available. "They're able to move quickly and the costs are coming down," a banker said. "Big pockets are out there and that will help get those transactions done." In addition, it helps private equity firms to keep a strong relationship with the cash-rich pension and sovereign wealth funds, which are also limited partners (LPs), or investors, in their funds. "LPs are very hungry," said Faisal Ramzan, London-based partner at law firm Proskauer Rose. "Strong LPs will try to make it a condition of their investments into PE funds that they will be given co-investment opportunities." By investing in deals directly, LPs could also save on fees, a second banker said. Pension and sovereign wealth funds have been expanding dramatically in recent years. CPPIB's investment partnerships portfolio that includes investments in hedge funds and private equity funds, as well as co-investments, ballooned to C$94.4bn (US$70.7bn) in the fiscal year of 2018 from C$77.8bn a year earlier. GIC increased its private equity investments to 11% of its portfolio from 9% during the same period, according to the funds' latest annual reports. No doubt, I expect more deals like GIC and CPPIB's mega deal taking Ultimate Software private. Why do I expect more deals like this? Because pricing is at historic highs and I don't expect this to change any time soon (for structural reasons) so the key differentiator in private equity will be large pensions, sovereign wealth funds and other institutional investors who have the ability to quickly analyze co-investments to scale into the asset class by capitalizing on attractive deals that come their way. This not only allows them to save on overall fees (pay no fees on co-investments), it also allows them to scale into the asset class to maintain their weighting in it (that's where they are getting the highest risk-adjusted returns over the long run). 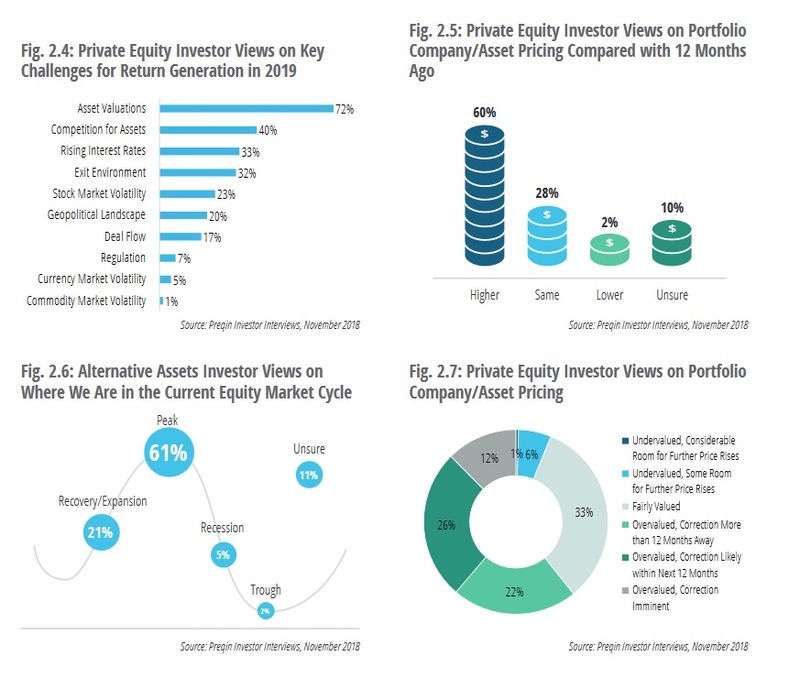 Clealy private equity is where investors are going to be focusing on the most in alternatives going forward but their approach will vary. Most will be in commingled pooled funds but the few that have the internal capabilities to do large, complex co-investments will do so. One thing is for sure, given the historic high multiples and increased competition, LPs and GPs will need a value creation plan to unlock value in their deals. That requires internal and external expertise. Two Sigma first set up a private investment group in 2008 to manage some of the company’s own internal capital. Last year it was quietly relaunched as Sightway Capital, went on a hiring spree — raising the number of employees from 15 in 2015 to about 40 today — and is now raising external money for the first time. The Massachusetts Pension Reserves Investment Trust this year approved investing as much as $500m in Sightway. Two Sigma declined to comment on any fundraising, but Mr Thorn said that “in the coming years, we believe that private equity firms that use more information and advanced approaches to decision science will have better outcomes”. The world’s largest asset manager, with $6 trillion in assets under management, is increasingly betting on nontraditional investments including private equity, hedge funds, commodities and real estate. The firm added at least four new roles to its alternative business unit that will combine the sales and investment teams, according to an internal memo circulated Tuesday. “The dramatic changes transforming both the markets and our industry ... represent the biggest opportunity in a decade to differentiate BlackRock – but only if we are willing to be bold and decisive,” the firm’s CEO, Larry Fink, and its president, Rob Kapito, said in Tuesday’s memo. When you see BlackRock making a huge shift into alternatives, it tells you two things: 1) Fee compression will continue in public markets where the bulk of active managers underperform indexes and 2) alpha and therefore fees and high margins are increasingly going to be in private markets and it's best to make the shift in focus now than wait another ten years and suffer the consequences. 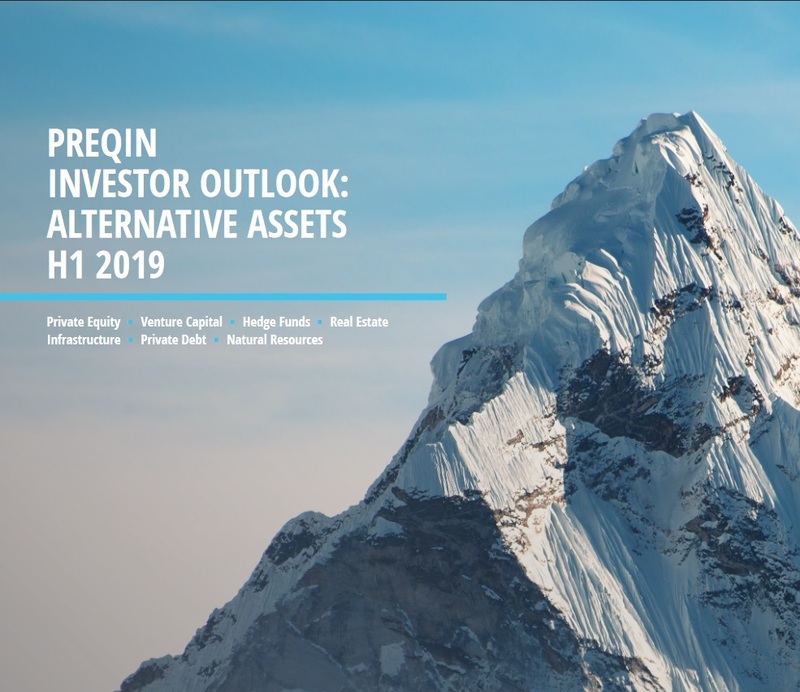 Anyway, take the time to read the Preqin Investor Outlook: Alternative Investors H1 2019. I only focused on private equity here but the report also goes over hedge funds, real estate and infrastructure. On infrastructure, I still recommend you read Andrew Claerhout's thoughts here as he explains why investors will have to begin using a private equity approach to infrastructure as the market continues to evolve. Below, Amanda Lang of BNN Bloomberg speaks with Stuart Waugh, Northleaf' managing director and managing partner on finding the sweet spot in private equity and infrastructure investments. Very interesting discussion, I really like his insights and their strategy. US Expansion Has Years to Run? The Caisse Tags Brazil in Major Deal? Ray Dalio's Quest to Reform Capitalism? Norway Selling its EM Bonds? PSP to Jointly Invest $2B in India's Toll Roads?